Les LL de Lambert s'invite à votre table ce week end ! Bienvenue sur le nouveau BLOG du Château Lambert, vous retrouverez des actus et infos de votre Château Lambert. Aujourd'hui (re)découvrez notre rosé les LL de Lambert. 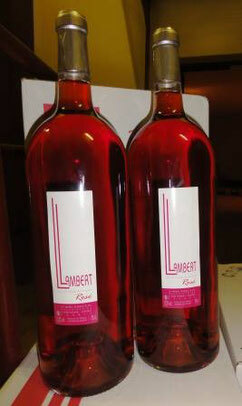 Vous ne rêvez pas, les bouteilles de notre rosé Les LL de Lambert sont plus grande que le carton car qu'il s'agit de... Magnums (1,5 litres) pour 2 fois plus de plaisir !!!! Its like you read my mind! You seem to know a lot about this, like you wrote the book in it or something. I think that you could do with some pics to drive the message home a bit, but other than that, this is excellent blog. A great read. I'll definitely be back. Hello! Someone in my Facebook group shared this site with us so I came to take a look. I'm definitely enjoying the information. I'm book-marking and will be tweeting this to my followers! Excellent blog and terrific design. I go to see everyday some web sites and sites to read posts, however this webpage gives quality based posts.